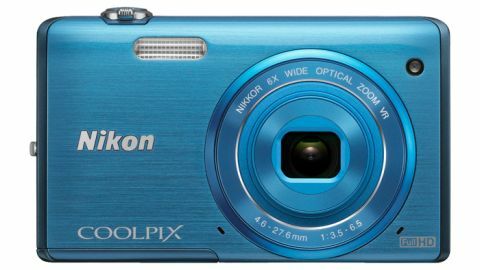 An update to the touchscreen-enabled Nikon Coolpix S4300, the Nikon Coolpix S5200 is a slimline compact camera, available in five colours with a 16 million pixel backlit CMOS sensor, 6x optical zoom lens with a 35mm equivalent of 26-156mm and 3-inch LCD screen. Nikon has opted not to include a touchscreen on this model, which is priced at £165/US$179.95 (around AU$241), sitting comfortably in the mid range area of the market alongside the likes of the Canon IXUS 140 and the Panasonic SZ9. With a pleasing weight once the battery is inserted, the Nikon S5200 fits easily into the hand and most of the buttons are easily accessible with a thumb, although some of the lower ones are a little tricky to reach when using the camera one-handed. All of the controls apart from the shutter release are situated on the back of the S5200, with the majority of the space being taken up by the 3-inch LCD screen. This is not a camera that feels cheap or flimsy - the casing feels sturdy, well built and durable. It's also compact enough to fit easily in a pocket, enabling quick and easy shooting on the go. Offering four shooting modes - Auto, Scene (with 20 modes available within), Special Effects and Smart Portrait - the Nikon S5200 is limited in its manual controls. Sensitivity, exposure compensation and white balance are adjustable in Auto mode, but there are no options to change shutter speed or aperture. There are, however, a variety of in-camera editing options available, including Glamour Retouch as well as the Special Effects mode, which has a range of digital filters including two toy camera modes, high contrast and a number of selective colour options. Video recording gives the choice of capturing footage from Full HD 1080p down to VGA, with single and full time autofocus modes as well as a wind noise reduction feature. On the whole, the options adjusting the shooting parameters are limited - in Smart Portrait, for example, exposure compensation is the only adjustable element from the options on the four-way control pad. The menu accessed via the button under this pad enables skin softening settings, smile timer and blink proof modes to be activated, but sensitivity and white balance are unadjustable. Smart Portrait mode works reasonably well, taking several photos and then picking the best shot. It also uses the indicator light on the front of the camera, which flashes when you're smiling enough - a useful addition if you're using it to take self portraits. One of the charms of the Nikon Coolpix S5200 is the option to charge the battery in-camera, which means not having to worry about losing the charger cradle, as well as being able to charge when the camera is plugged into any computer. This makes it an ideal camera to take travelling, since it requires very little paraphernalia and the lead is compatible with a range of plugs and devices. Nikon has added five new Glamour Retouch modes to the S5200, bringing the total available up to eight. They range from the useful Whiten Eyes to the slightly disturbing Small Face and Big Eyes. These effects can't be applied to photos that are taken in Smart Portrait mode, which seems unusual because they're obviously going to be most useful for portraits of people. It's a nice set of options to have but the edits can be a little clumsy and aren't likely to replace even the most basic of editing software available off the camera. Marketed with easy to use inbuilt Wi-Fi technology, in reality it was a little tricky and time consuming to get the Nikon Coolpix S5200 to connect to our wireless internet, for ultimately little reward. The in-camera help is non existent for this feature, so make sure you have your manual to hand if you try it. You can connect the camera to a smartphone or tablet (once a free app has been downloaded) and then take photos with the camera via the smartphone, enabling it to act as a remote. The photos are then stored in the app as well as in the camera, so you can upload them straight to social media sites if you wish. If you don't have a smartphone or tablet then you're out of luck, since this feature doesn't work with laptops or computers. Although remote shooting is an neat function in theory, but it's difficult to think of a situation in reality where you would need to use it regularly enough with a compact camera to deal with the faff to set it up. It'd be great to see an option for emailing/uploading directly from the camera - as you can from the Samsung Galaxy Camera - and the ability to connect to computers as well as smartphones. Existing users of Nikon cameras will be at home with the menu structure - much of which is easy to navigate and is fairly intuitive. There are some features that are perhaps located in an odd place on the menu structure, such as the info display options, which are buried deep within the settings menu. Overall though the Nikon S5200 is fairly simple to use, and it shouldn't take long to become comfortable with it.